The case law of international courts and other international supervisory bodies has shaped human rights standards. Human rights treaties are often interpreted as “living instruments” following a dynamic or “evolutive” approach. 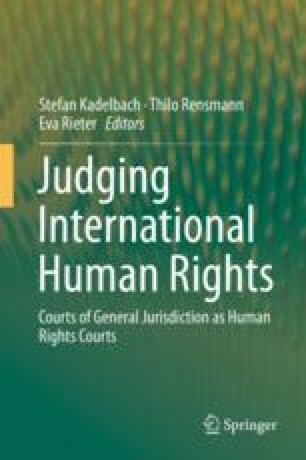 Respect for human rights treaties and the guiding function in interpretation essentially rests on the reception by domestic courts and other national bodies. As interpreters of international treaties, these national courts and other domestic bodies also may compete with international courts as to the determination of human rights standards. This chapter unfolds the rich spectrum of approaches taken by domestic courts, which have developed various mechanisms to defer to international jurisprudence, which do not always fit the traditional models of “monism” or “dualism.” On the one hand, many constitutional or supreme courts are nowadays disposed not only to consider international courts as highest authority on interpretation of human rights standards but also to be guided by their interpretation when applying national law. On the other hand, in some countries, resistance to the evolution of treaties by international courts and the reliance on sovereignty as a check on extensive interpretation has considerably gained traction. The receptivity of national courts to human rights standards as applied by international courts and other treaty bodies not only strengthens the legitimacy of any “evolutive” interpretation. The discussion of international case law also provides the courts of contracting States with the opportunity to participate actively in the process of interpretation and in the cautious development of treaty standards.